PORTACLE™ is a term created to describe the intellectual property developed by the consulting consortium Winship Global Alliance. 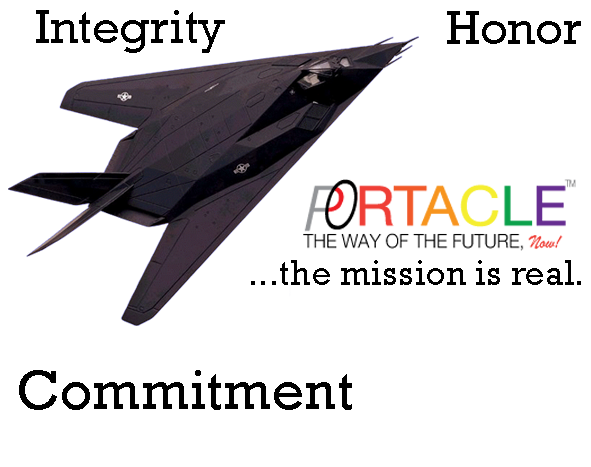 The term PORTACLE™embraces a highly contagious culture of professional entities including for-profit businesses, non-profit organizations, business consultants, executive coaches, seasoned entrepreneurs, and experts from various backgrounds and disciplines.Two distinct concepts collide to create the term PORTACLE™. The first concept is that of a “portal.” Typically the word “portal” is used to describe a distinct entry point. That “entry point” will most often lead a person into a much larger, expanded reality, something dramatically different than what they were previously experiencing. It is much more than a simply door or entry-way. It is an access point into a transformational reality. In its largest sense it is if a person (or corporate entity) is leaving one world behind for a new one. The conviction driving this enlarged language is that organizations must periodically transition from the current reality in the marketplace into the new reality if they are going to remain vibrant, relevant, engaged, productive, and yes, even profitable. The instruments that promote and drive that type of ongoing creative energy within an organization are inherent components of the PORTACLE™ Culture. Utilizing timeless truths, technological advancements, proprietary metrics, the most up-to-date business savvy, and cutting-edge human capital development tools are just some of the ways that we open the portals to create access and promote a culture of positive forward progress within any organization.The second concept collided to create the term PORTACLE™ is “oracle.” So, as one can see, the words “portal” and “oracle” collided to create PORTACLE™. All of the letters of each word are fully contained in the newly created conceptual term. Not only the letters have collided but so have the individual concepts. The word “oracle” unquestionably has historical connections to mysticism; most notably the Oracles of Delphi of Greek mythology. These women who pronounced the Delphic oracles where considered to be uttering wisdom given them by the pantheon of Greek gods, in particular Apollo. In its current usage the term “oracle” refers to “an authoritative or wise statement or prediction.” Our intention, as we come alongside and work collaboratively with an organization, is to speak the “word of truth” into its collective life. This is often the least “scientific” aspect of what we do at PORTACLE™, but it is very often the most important. Truth that has been avoided and swept under the carpet for years is often the hardest thing for an organization of any size to talk about, but most of the time it is the very thing that is holding an organization back from obtaining true success. All of the tools, tricks of the trade, marketing savvy, and even human capital development skills will carry you 75% of the way toward organizational success. But without addressing the company dirt that hides underneath the carpet, no organization can achieve true success in this highly competitive marketplace. A very wise man, considered to be a prophet and oracle amongst many other things, once said,“you will know the truth and the truth will make you free.”In summary, PORTACLE™describes a very committed and intentional practice of helping organizations succeed through a variety of organizational development tools and current best practices in the fields of consulting, training, and coaching. These practical skills are then aligned and combined with practices of discernment and truth-telling in regard to a given organization’s stumbling blocks and constraints as they have endeavored to keep pace, adapt, and grow in the swiftly changing world marketplace. The combination of wisdom, truth, and the very best operational principles and practices makes for a dramatic difference in the way any organization maneuvers through the minefield of organizational and cultural change that is part and parcel of the 21st Century landscape. PORTACLE™is a unique, creative, and highly-skilled group of professionals who are eager to help organizations and businesses re-shape their culture and position themselves for current realities, ongoing profitability, and future leadership succession. In summery, our approach is more effective because we exercise restraint while applying maximum wisdom to the situation in order to ensure the client gains and applies the solutions.